The entrance to the new Exploratorium science museum on Pier 15 in San Francisco. At the Exploratorium, one does not stand stiffly in front of musty exhibits and read tiny placards. There is no room for boredom or passively observing. The installations at this interactive science museum are hands on - they require touching, building, playing, experimenting and thinking. And in the Exploratorium's shiny new space, the experience is just as much for adults as it is for children. 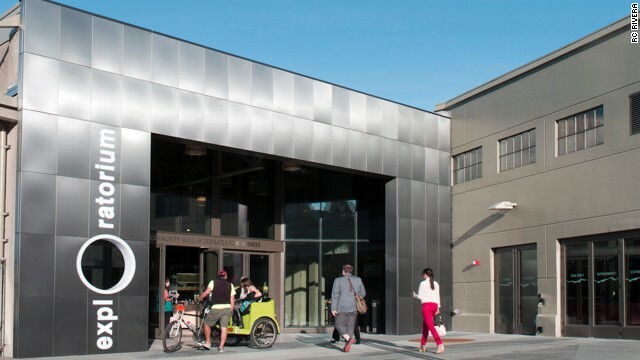 On Wednesday, the doors open on the Exploratorium's first new home in its 44 years, the $250 million renovated Pier 15 on the Embarcadero, San Francisco's eastern stretch of waterfront. It is three times larger than the old museum, the cavernous exhibit hall at San Francisco's Palace of Fine Arts, which was originally built for the 1915 World's Fair. The Exploratorium was originally opened in that location in 1969 by physicist Frank Oppenheimer.